For all of my fellow frugal crafters out there, I've collected a bunch of vintage or vintage-inspired free sewing, knitting and crochet patterns for you! I find new patterns all the time so this list will be updated constantly, so do check back! If you posted a free pattern to share that isn't listed here, please leave a link in a comment below. Also check out my Pinterest board, "Sew Vintage" for more beautiful free vintage sewing patterns and check the bottom of this page for free vintage millinery book downloads! Please note: Some of these patterns were posted ages ago and the blogs have since been shut down or taken over by someone else using the old domain. 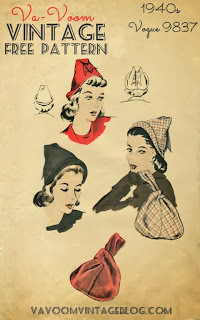 The patterns are still available through Pinterest or the Wayback Machine internet archive. Any patterns marked with ** are only available through the link I've provided here. This page is updated several times per year to add new patterns and make sure old ones are still working. If you find a broken link, please drop me an email and I'll try to find a new link or archive to the pattern for you! Accessories, Swim, Playsuits and Misc. How to make a playsuit from a dress by They'd Have Called Me "The Bar Nothing"
1942 brimmed hat, super cute!